There’s many benefits for Manitobans choosing 100% grass fed beef, pastured pork, poultry and eggs. My interest in grass fed beef, pastured pork and poultry started with concern for my land health, own health, my livestocks health and their quality of life. My interest has now grown into a passion and a business that I thoroughly enjoy. Properly managed, grass fed beef, pastured pork and poultry are not only much happier and healthier animals, the benefits of eating a natural diet, living life in a clean, stress free, natural environment produces a far healthier, full flavored product than the industrial model. 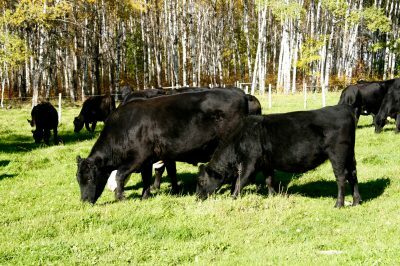 Grassfed and pastured animals have access to all of the fresh green,growing forage they can eat when in season. This not only produce a far healthier product, the management techniques required keeps the animals moving across their pastures which improves pasture yields, builds topsoil, controls potential parasites and protects the animas from disease. This allows me to produce a drug, antibiotic and chemical free product. Below are a couple of links to a powerful collection of easy to read articles that I highly recommend reading before choosing between naturally raised grass fed beef, pastured pork, poultry and poultry products or the industrial equivalent.